Leiden or The Hague: Where to live as a student at Leiden University? Choosing where to live can be extremely tricky, especially if you have never visited your potential new hometown, or worse, know little about the place. Like many prospectus students at Leiden University I oscillated between wanting to live in a city like The Hague or a smaller town like Leiden. When I arrived in Leiden a few weeks before my studies began, I visited rooms in both Leiden and The Hague. The aim of this article is to raise points to ponder and hopefully help you clarify where you would like to live. Where will most your classes be based? Even though The Hague and Leiden are only 10-15 minutes via train, getting to Leiden or The Hague on a wet wintery Monday morning for class will make you reconsider choosing the further location over the more convenient. Where you have most your classes is also going to be the likely location where most your classmates live, work and socialise. Do you want to be in the thick of the action, or a bit removed? What do you prefer, a city or a town? It’s probably the first consideration when you have visited or at least read about both The Hague and Leiden. Although deciding if you prefer small cities or small towns is not essential, I do think this is still worth some reflection. Although both places are (almost) equally close to Rotterdam and Amsterdam and to smaller towns like Utrecht and Haarlem, you have to decide if you would like to stay in a predominantly student town or a working city. It’s also important to realise what both places have to offer academically and non-academically. If, like me, you will be studying International Relations, then you should consider all the events and NGOs, government organizations that are based in The Hague. How much time do you have to look? Time helps a lot when you are competing in a vicious Darwinian survival of the fittest competition for housing, as sometimes it felt when I was looking for a roof over my head. The shortage of student housing stock (particularly in Zuid-Holland) makes it increasingly difficult for students to immediately secure their first choice accommodation. Before I came to the Netherlands, I tried to secure a room, months in advance through Facebook groups such as Leiden Housing. Although I subsequently learnt that some of my peers had in fact managed to successfully get a room via this method, the success stories were few-and-far-between. This is because the mentioned student housing shortage (the landlords and real estate companies can almost always find someone in need) and the fact that landlords are unwilling to risk you not turning up at the last minute and having to find a new tenant. My advice would be to come to the Netherlands as soon as you can in order to make appointments in person. If you don’t secure a room on your first attempt, do not despair, for at least you have increased your first-hand knowledge of the housing situation is and you can change your approach or location if necessary. What type of living experience do you want? Not much needs to be said here as I have covered this in point 2. However, I would add that even if you are forced to live in The Hague when you want to live in Leiden or vice-versa it is not the end of the world. You will find advantages with living in both places over time and although you might not live in one, the other is easily accessible by train. So don’t worry too much! Most importantly, your budget will define what type of place you will have and ultimately end up living in. You, like me, will probably come to the Netherlands with an idealistic budget; this will be well under what you will eventually pay. Make sure you give yourself enough elasticity to alter your budget (upwards) if, and probably inevitably, will be the case. Although it is good to keep the above points in mind, remember that once you are in the Netherlands your opinions and needs are likely to change, that is not to mention the more-then-likely moment of panic you will experience as the start of the semester draws closer. Don’t let panic dictate your choice of housing! Be patient, even if the first few days, weeks or even months are stressful. You will find something; it is a waiting game of luck! Everyone I know has eventually found somewhere to live (even if their first home was not what they wanted long term). 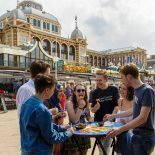 Hi Dylan, I’m sure Sebastian, the blogger of this post, will have lots to say about studying and living in The Hague but you can also reach out to other students who are living there as well, and in the BAIS programme. Julia Seidel can be reached at study@bb.leidenuniv.nl, Rachel Quennell can be reached at r.e.quennell@hum.leidenuniv.nl and Lorenzo Mussachio at l.musacchio@hum.leidenuniv.nl. They are all happy to chat with students considering BAIS and living in The Hague. That being said, The Hague actually has thousands of students and is the most international city in The Netherlands and there really are endless social and academic opportunities. There is a student association called BASIS for BAIS students, many groups/committees/clubs to join. Student life at Campus The Hague is separate from Leiden, but you won’t be missing anything! Hi Dylan, I am still a student here at Leiden and I’m doing my masters in International Relations based in the humanities building in Leiden. Many people live in the Hague and have almost all their classes in Leiden or vice-versa so for me I don’t think it alters the student experience too much. I personally do not think the Hague is a boring place, I have another blog about The Hague which explains why I think it isn’t boring, maybe you will agree with me after reading it! With The Hague (like Leiden but i think a bit more so) It depends where you live in the city. I have a friend who lives in the student Hotel near Holland Spoor station in The Hague, it’s a great facility with lots of communal spaces and most of the tenants are bachelor students. If you find a place like this you will certainly not miss out on student life. I would also suggest looking at some of the facebook groups concerning student housing in The Hague, students will post free rooms for other students. The Hague and Leiden are really close (10-15mins via train) so if you have friends or you are a member of a society etc it is really easy to get to Leiden. There are many people on my course who commute from Amsterdam, Utrecht, Haarlem etc, they are active in student life here in Leiden and many of them come to our borrels. The best suggestion I can make is to take some time to visit both the Leiden and the Hague and speak to some current bachelor students. I’m sure the Leidener can get you in touch with some students. I hope this helped, if you have any more questions feel free to send me a message or comment on this post. Is the Hague or Leiden generally considered more expensive? I have conflicting opinions from Dutch students.. It really depends – you can find accommodation at all budget levels in both locations, but the center of either city will be more expensive. The Hague is a bigger city, so it may be on the more expensive side. I’ve been thinking about applying for International Relations at Leiden. Do you enjoy it – is it very challenging? I was also wondering about internships, do you get much assistance from the university in finding one? Yes, I do enjoy the course here! From my perspective, the most challenging part of the course is probably the Thesis as you only have one year to develop your question etc. and you will probably only start writing it in the second semester. There is also a lot of reading but most of it is very interesting and that shouldn’t deter you. If you have done IR for your BA the Master program seeks to challenge some of the assumptions in mainstream IR and is quite critically orientated which I ‘m finding refreshing. Also Leiden is one of the best in Europe for Area studies so the expertise of different regions allows you to take different classes from other faculties – such as Middle Eastern Studies, East Asian Studies etc. With regards to internships I have personally seen the career service here and they were very helpful in suggesting the steps I should take for gaining an Internship – for example they looked over my C.V. and suggested ways to make it look more professional. The fact that Leiden is so close to the Hague also helps as lots of NGOs and Government affiliated think tanks are based there. Lots of people on the program end up taking an Internship for either extra credits or after graduation. Students from Leiden have an advantage when it comes to gaining internships in the Netherlands as the university is well known, especially for IR and other humanities. If you have any other questions send them my way! Hey! I’m moving soon to Netherlands to do a LLM in International Children’s rights. My classes will be in Leiden, but I just have 8 hours a week, 3-4 days a week only. I’m considering where to live and if living in The Hague would have more professional advantages. Wich areas would you recommend me either in The Hague or Leiden? Im moving in august and planning to search once there, coz its being pretty dificult to find something from abroad. As we’ve been on vacation, we’ve just seen your comment. I hope you have already started your house search! Please keep in mind the costs associated with travel from Leiden to The Hague when budgeting to live in either city. There are many great places to live in both locations, and a good place to start is the Leiden University Housing page. They have a list of tips for those looking on their own. You can also find student housing facebook pages where people will post available options. Good luck! hi,i am Rose from Cameroon. I will be caming to Leiden to study a master of Clinical neuropsychology.I have paid for a room at Leiden campus for internationales.I wish to know where mots of m’y classes will take place and also how is thé student life in Leiden home for internationale. Hi Rose, and welcome to Leiden University! I’m sure some of our bloggers will also reply, but I wanted to let you know that most of your classes will be in our Pieter de la Court building for the Behavioural and Social Sciences, at our Leiden location. There is lots to do in Leiden and many students join the International Student Network, Leiden United or other social and academic clubs. You can find all sorts of information for current students here: http://students.leiden.edu/. I just wanted to have your opinion (or if you have heard any) about the housing provided by the university ? I might consider going through with the uni’s service, but I really want to make sure that the rooms provided are well located and that there are no massive problems (internet related for example). The university service (DUWO) varies. Some rooms are great, others are fairly poor and the cost is usually high. I would apply for uni rooms if you can, and hope to land a good room as it is highly competitive in the private rental market. However, if you have time, visit Leiden or the hague before you start and give yourself time to look and find the best room for you. I’ll start studying in The Hague next september at the Leiden University campus in IR. I wanted to know if their is a special district where all the students live. And as I’m a bachelor student, I don’t know anyone there and would like to find a student room in a cool surrounnding.. have some advices ? Thank you very much, I am really excited to experience the Netherlands! Hello, I’d also really like to study international relations and Organisation at Leiden university in The Hague, but I wasn’t able to find more specific details about the admissions, aside from the required diploma of high school or equivalent schools. So what is the university looking for? What else is required or appreciate in order to get admission? (Like internships or social engagement etc) or does only the diploma count? This programme is a BSc in Political Science with a specialisation in International Relations and Organisations. It is taught at our location in The Hague. Admission is based upon your secondary school diploma, letter of motivation, CV and English proficiency exam scores (if applicable). The official document listing is here: https://www.universiteitleiden.nl/en/education/study-programmes/bachelor/political-science/international-relations-and-organisations/admission-and-application/required-documents. I hope this helps! I’ve been accepted into Leiden for the Museums and Collections masters program for September. I’m from Hawaii but I’m currently working in France for the year and I was wondering what to do about accommodation. I know that I’m guaranteed accommodation through Accommodate, but the prices are a bit out of my range. I’ve been looking through Kamernet, DUWO (vote-ins and offers), Pararius, and while it seems that there are more choices, I’m worried that I won’t be able to find a place before my residence permit deadline April 1st. I know it seems like I have a lot of time but I have to find a replacement for my flat in France as well and I can’t do that until I know when I’m moving out. It seems that the housing through DUWO is cheaper (in some cases) than the university’s. But the university does provide furnished rooms, which is most ideal for me. As you can see your comment was not deleted, but the university was closed when you commented so unfortunately were weren’t able to get to a reply quickly. DUWO is the company that Leiden University works with to provide international student housing. You can apply through the Housing Office for a room, though you should apply as early as possible as there is more demand than is available. DUWO on their own has other options, and you can contact them if you choose. Also, you can try Facebook groups to see what options might be possible. I am not certain about the April 1st deadline you are referring to – that is the application deadline, not residence permit deadline. Even with university housing you would not receive an offer until June or July. You can contact the Housing Office if you have more questions: http://leidenuniv.faqtory.nl/questionForm?lang=en&categorie=Housing. I hope this helps! Ah okay. Well, it was gone for a few days. I’m not sure if he’s part of the Leidener as well but someone was able to help me with my housing questions. Great! I’m glad you got it sorted! I put in a housing application with Leiden University and paid the fees to receive their help in finding accommodation. Should I fully trust that they’ll find me a room on time? Or should l consider searching on my own? Hi Nicole! Housing is offered on a first come, first served basis. The deposit puts you on a waiting list. Therefore you cannot assume you will get an offer from the Housing Office. You may also find the offer they are able to give does not meet your needs in some way, and therefore you might decline their offer. It is always best to have a back-up plan, and also search on your own. Housing offers normally come in June or July, so you should their response. In the meantime, use the Housing Office website for tips on how to locate housing on your own – just in case! Hi, first of all thanks for all the info you gave, very useful. I have a question though: what about the transport costs? I will have all my classes in leiden but I saw there are more houses in The Hague… but wouldn’t cost a lot more to move from The Hague to Leiden everyday back and forth? do you have any information on that? Hi, I’m Begum from Istanbul and I am currently considering to apply for one of the LLM programs in Universiteit Leiden for next year. However, as far as I can see, accommodation opportunities in Leiden cost slightly more than the ones in Den Haag and the rooms I have found in Den Haag look better and more comfortable. Therefore, I am thinking about living in Den Haag and take the train to Leiden for my classes but I am not sure how much will it cost me for a year. Is there a discount card that I can get which will allow me to travel as much as possible between Leiden and Den Haag? You have mentioned that there is a student discount card for Dutch students but unfortunately I am not eligible for that so I am looking for a different deal, if there are any. Dear Begum, Indeed, accommodation in Leiden can be more expensive than The Hague. Some students who are studying in Leiden choose to live in The Hague, but even though The Hague is close, often they prefer to move to Leiden where possible. There is a 40% off discount card you can purchase for off-peak train times from the NS (national Railway). It is not a student card but anyone can purchase it. However, the majority of your fellow students will likely be living in Leiden, as will be the social activities for your faculty. For this reason you might want to consider housing in Leiden or nearby towns such as Voorschoten, Leiderdorp or Oegsgeest. These are all within biking distance of Leiden, but you might find less expensive options there. Housing is at a premium everywhere in the Netherlands it seems, so looking early is a must! Good luck! This entry was posted on February 10, 2016 by seb in Living in Holland, Practical Stuff, Sebastian, Uncategorized.